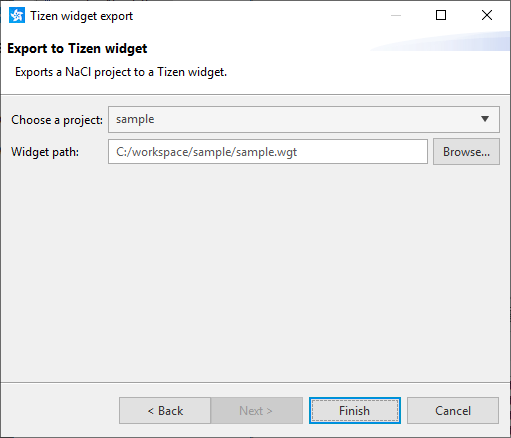 This topic describes how to export a Native Client project as development files, or as a Tizen application package. You can export your project files to, for example, create a backup or import into a different Tizen Studio installation. Exporting the project ensures that all required files are included. In the "Project Explorer" view, select the project. 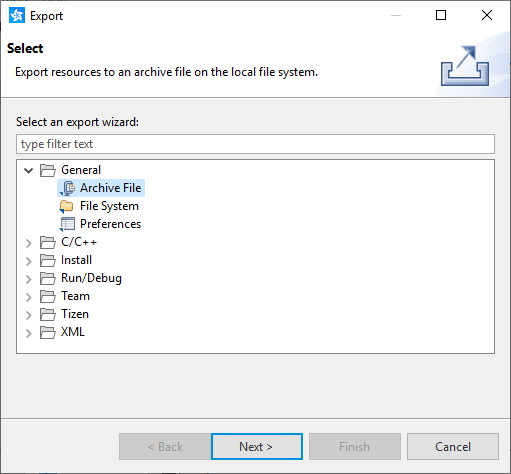 In the Tizen Studio menu, select "File > Export". Select "General > Archive File" or "File System", and click "Next". 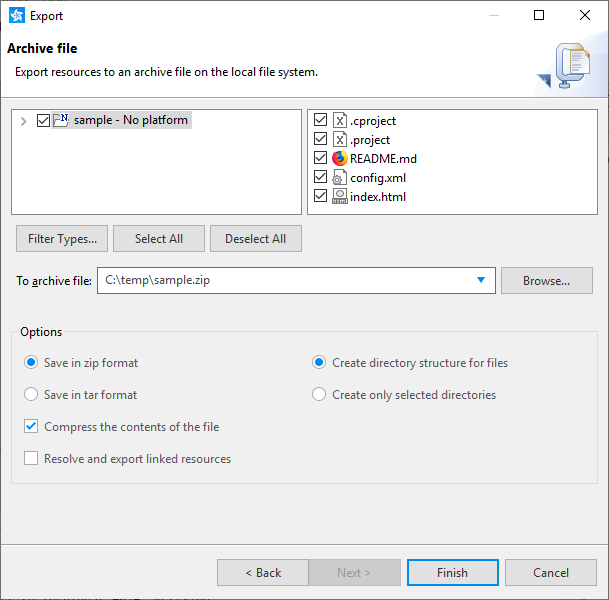 Define the files within the project to export, the file name or directory to export to, and export options. If you have defined a target directory that does not yet exist, to confirm creating it, click "Yes". 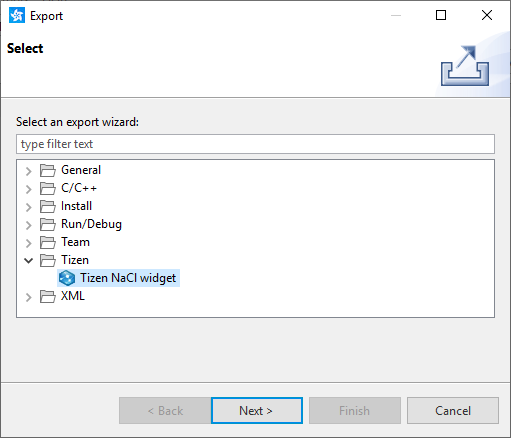 For information on importing a NaCl project to the Tizen Studio, see Importing NaCl Projects. A ".wgt" application package can be created from a Native Client (NaCl) project in the same way as a Tizen project. To have the required configuration files, you must have already built the project at least once. 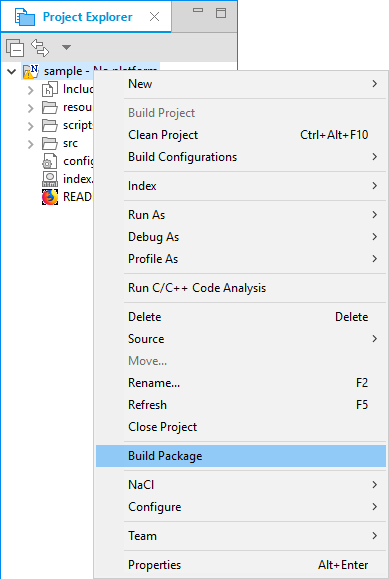 To create the package within the project directory, in the "Project Explorer" view, right-click the project and select "Build Package". The package is created in the project directory with the same name as the project. In the Tizen Studio main menu, select "File > Export". Select "Tizen > Tizen NaCl widget" and click "Next". Select the project, define the target package path, and click "Finish".